Online Reputation Management has drastically evolved and changed the manner in which people perceive products and services. More and more people are using the internet to evaluate the credibility and quality of products or services based on the online profile of the company/brand. Hence, to manage the credibility of your business, it is very important to adopt measures that enhance the reputation online. With the steep increase in demand for such a service, a number ORM or the Online Reputation Management companies have emerged over the years. Which company to select and what factors to look for while hiring a company? First and foremost thing would be to stay away from a company that spends a lot of money on advertising. For instance, the term online reputation management has over 8,100 searches per month on Google. Hence, the company that advertises for the popular keyword is definitely spending a lot of money to stay there. Hence, these are the companies who prioritize the acquisition of new customers instead of servicing the old ones. Hence, instead of being trapped by those paid ads, one should scroll to the search results that appear below. Select the ones that are ranking without the need of any advertising and only appear as organic search results. The next thing to do would be to go through the reviews that the company has received online. In case you find that they haven’t been able to build a good case for their services, it would be a better idea to try a different company from the same results page. What do to after you have rounded up on a service provider? 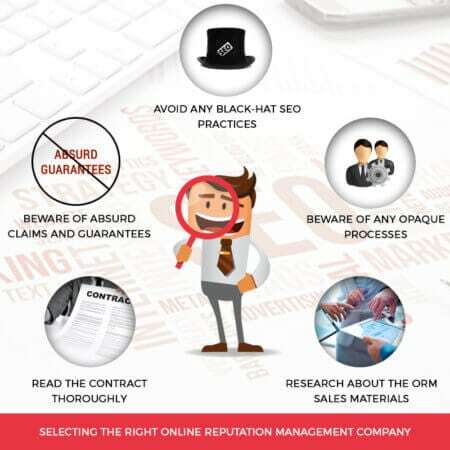 Beware of absurd claims and guarantees: Some firms make false or absurd claims like they have been there even before Google existed or they have a quick fix that can guarantee a rank in under 6 months. Some might even state that they have some kind of proprietary software that works against Google. In any these cases, it’s better to avoid the firm. Avoid any black-hat SEO practices: Some firms may adopt a strategy of keyword stuffing, link farming or strategies which try to trick Google. In case they try to adopt any of these in an attempt to outsmart Google, then they are a strict NO! The only approach that gets you a rank on Google is by working as per its guidelines. It’s only valuable content that ranks better and only quality work gets the desired results. Beware of any opaque processes: Before you select a particular firm for ORM, do ask them some questions like how they would be reaching the desired goals? Do they intend to adopt bookmarking submissions or rank by using high-quality content for the target audience? The company has to be fully transparent regarding these queries. Research about the ORM sales materials: After a brief discussion with the representatives of the company, you will surely have access to the sales materials. It may be in form of a tailored proposal, case studies or a rough outline of the structure of the campaign. A thorough review of the recommended processes and their quality is pretty essential. Read the contract thoroughly: Understanding the contract thoroughly is pretty important as well. Carefully review their terms and if the firm makes any promises like they have the ability to suppress any negative search result, it would be advised to avoid their services. SEO is an industry that comes with no guarantees, hence no single firm has the ability to deliver 100% certain results on Google. There are certainly other factors that play a critical role while selecting a firm offering ORM services. A firm might definitely ask for an upfront payment before beginning the entire process of Online Reputation management. However, a good firm will always stay confident on their services and hence might also accept payments on a monthly basis. It is recommended to go for plans that offer sensible deliverables and charge on a monthly basis with detailed reports for their work every month.